Need Garage Door Roller Replacement? We repair and replace broken or warped rollers on garage and overhead doors. Garage door roller replacement is essential if they are worn, bent, or broken. The rollers help guide your door up and down along its track smoothly, just like a wheel bearing helps the wheel of a car turn smoothly. If the rollers on your garage doors have gotten really dirty or rusty or just plain tired from the constant wear and tear of using the door, they can break or come off their track. The result is the door that may be really difficult to operate, noisy, or it might even get stuck! Don’t wait until it is broken if you start experiencing shuttering and noises when opening and closing your door. 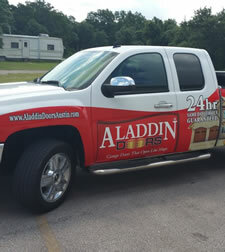 Aladdin Garage Doors Houston is a garage door service and repair company serving the greater Houston area. We specialize in the inspection, maintenance, and repair of garage door and overhead door roller and track systems. Call 281-252-3346 now to talk with a garage door technician. Important Door Roller Info: Aladdin only sells 13-ball bearing nylon rollers to ensure the door rolls smoothly along the track. We use 7” stem rollers at the top and bottom fixtures of the door to ensure that if the door is bumped/hit that the likelihood that it will come off the track is reduced. Aladdin Garage Doors Houston backs this product with a lifetime warranty. From fixing the rollers on a single door to replacing or fixing rollers on a dozen doors or more in a large facility our experienced door technicians will arrive with the necessary parts and tools to complete your repair on the first visit. Our local Houston area garage repair company is family-run. We take pride in a job well-done. We are staffed to be available 24/7/365 for any garage door repair from garage door roller replacement to panel repair to opener repair. You will love our customer service! We specialize in repairing and replacing broken, missing and worn out garage and overhead door rollers. One of our overhead door technicians will arrive on-site in a company truck with all of the parts and tools necessary to repair your door in the first visit. If you’d like to receive an estimate to repair or service the door rollers in your building please give us a call 281-252-3346 or fill out our contact form and someone will be getting right back to you.